Cindy Rarick’s career as a golfer has been about low scores, but the business plan for the five-time winner on the LPGA Tour is just the opposite as director of Silvara Vineyards – her young, critically acclaimed winery in Leavenworth, Wash.
“We get a lot of people coming into the tasting room who have heard that a golfer is part-owner of the winery and they’ll ask, ‘Is the golfer here? I’d like to talk golf with her,’” Rarick chuckled. 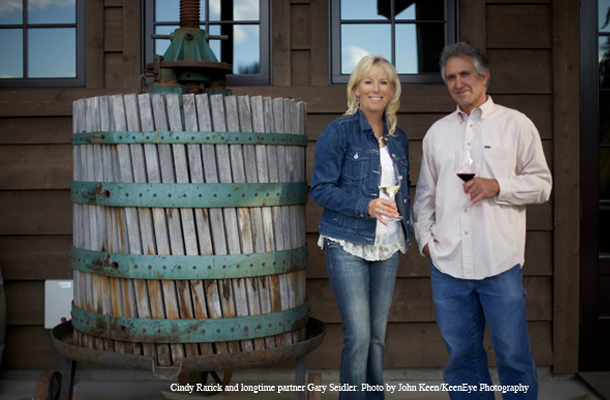 The wines, made by longtime boyfriend Gary Seidler, are worth the visit. At the 2013 Seattle Wine Awards, the Silvara Vineyards 2010 Riesling received a double gold and the 2009 Red Blend picked up a gold medal. The 2010 Quartette, another red blend, began earning superlatives from wine judges soon after it was released to the public. And all Silvara wines are made with Columbia Valley grapes. Seidler neither played golf nor had an interest in the game until meeting Rarick by chance while on a plane traveling to Las Vegas for a NASCAR race. On the other hand, she’s been a wine lover for years, and her tastes continue to evolve, especially since opening her own winery in 2008. A career in golf that began as a junior in Glenwood, Minn., led Rarick to the University of Hawaii, career earnings on the LPGA Tour of more than $2 million and a snowbird home in Tucson, Ariz. None of those locales are viewed as “wine country” in the classic sense, which explains her reaction when Seidler approached her about a new career in Washington state. Rarick enjoys being able to blend wine with golf while in the Wenatchee Valley. She works on her game between Leavenworth Golf Club, Wenatchee Golf & Country Club and Mount Cashmere during those weeks she’s at the winery. She helps with fundraising for the Leavenworth High School golf program when her schedule allows and talked up the area so much that Jan Stephenson, a former LPGA Tour star and longtime friend, visited for several days. After five years, Rarick, 53, talks like a Wenatchee Valley tour guide. She also knows the Puget Sound area well from her days on the LPGA Tour. That connection with western Washington continues via the Legends Tour, which has stopped in July the past two years at Inglewood Golf Club in Kenmore for Swing for the Cure. Rarick remains competitive on the Legends Tour and especially looks forward to the Wendy’s Charity Challenge on Aug. 11-12 in Jackson, Miss., where she lost last year in a playoff to Barb Mucha but still picked up $8,000. “It was fun to be in that position and get the juices flowing,” she said. Rarick’s best stretch on the LPGA Tour came from 1987 to 1991 when she won at least once each year except in 1988. She won twice in 1987, starting with the Hawaiian Ladies Open, a two-stroke victory over Jane Geddes. Many wine lovers tend to forget that what ends up in their glass begins with farming grapes, and Mother Nature makes it a gamble – even though Washington state’s climate, soils and irrigation remove some of the risk. It’s also a reason why the phrase, ‘How do you make a small fortune in the wine industry? Start with a large fortune,’ is only a half-joke to Rarick and Seidler.